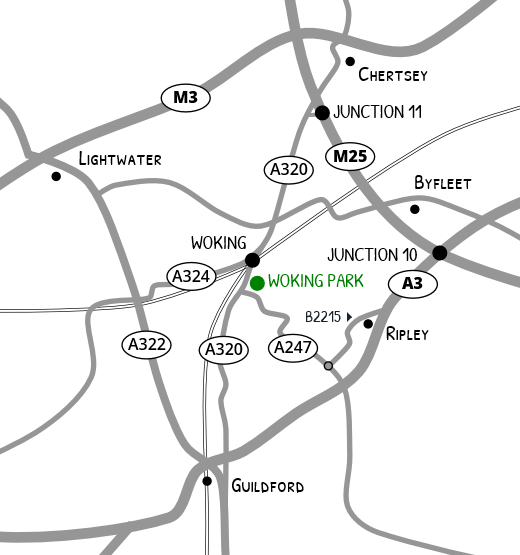 The Leisure Centre is situated just south of Woking’s main town and train station. It is a 10-15 minute comfortable walk from both. Woking station is on the mainline to London Waterloo. Trains take about 30 mins to Waterloo, 30 mins to Basingstoke and 10 mins to Guildford. There is ample parking at the leisure centre. Kingfield Road, Woking, Surrey GU22 9BA. 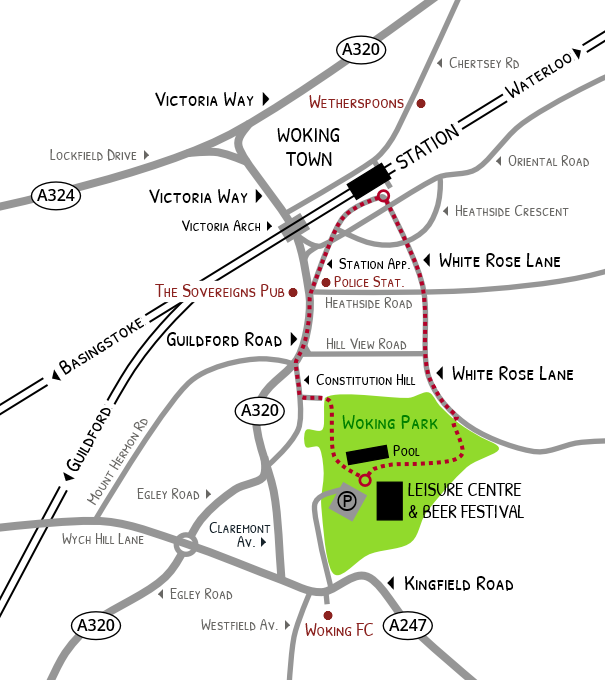 There are two routes which lead you through Woking Park to the leisure centre. Both take about 10-15 minutes at a comfortable pace and start from the car park (non town) side of the station. The walks can be accessed from the town via the station pedestrian subway or through Victoria Arch. Take A320 into Woking, along Victoria Way past Peacocks Shopping Centre, under Victoria railway arch, follow A320 towards Guildford. Turn left at bottom of hill, Claremont Avenue (signposted A247 and to Leisure Centre) and left again into Kingfield Road. Leisure Centre and Pool car park entrance is on the left opposite Woking Football Club. Head southbound towards Guildford. 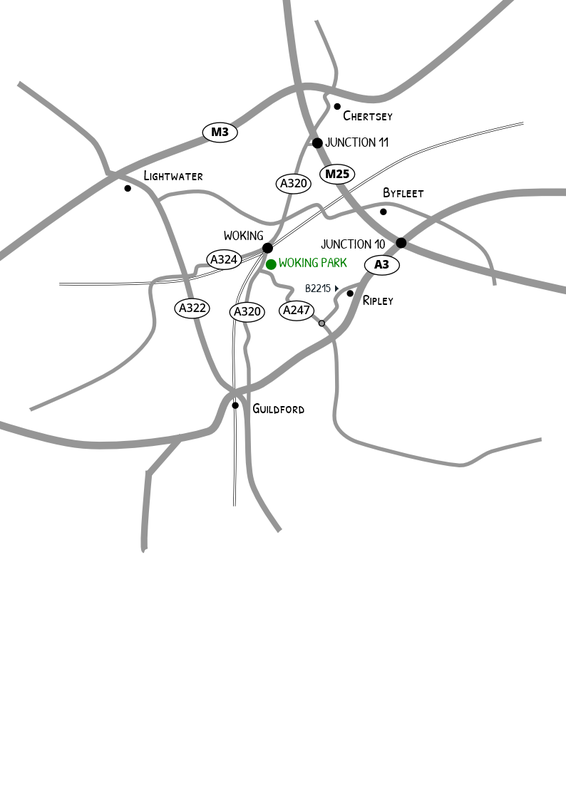 Take slip road exit for Ripley and follow Portsmouth Road B2215 through Ripley until Burntcommon Roundabout. Turn right onto A247 towards Send. Follow road to Old Woking. Turn left at mini roundabout, right at second mini roundabout into Kingfield Road. Leisure Centre and Pool car park entrance 1/2 mile on the right. On entering the car park, the leisure centre is in the top right hand corner, the pool is to the left. Parking spaces for disabled are available adjacent to the bridge ramp into the leisure centre and beyond the main car park, at the top of the slope in front of the main pool building.